The Archbishop of Canterbury has accused the UK government of placing Christians in the Middle East at risk through its actions in Iraq. 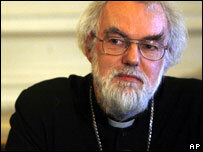 Dr Rowan Williams, head of the Anglican church, said there had been a growing number of attacks on Christians. He is on a pilgrimage to the region with the leader of the Roman Catholic Church in England and Wales, Cardinal Cormac Murphy-O'Connor. The government said its policy in Iraq was not the cause of such attacks. "It is the intolerant extremists that are inflicting the pain and suffering in Iraq and other parts in the Middle East," a Foreign Office spokesman said. "We are doing all we can to support the Iraqi people." Dr Williams told BBC Radio 4's Today programme there was "no doubt" that life for Christians in Iraq had become more difficult since the invasion. "What we have seen in the last year or so in Iraq has been attacks on Christian priests, the murder of some Christian priests, and the massive departure of large numbers of Christians from Iraq," he said. "The situation has got worse since Saddam fell." His comments come after he told the Times newspaper ministers had ignored warnings Christians in the region "would be seen as supporters of the crusading West". Among the results was the shrinking Christian population in Iraq, he said. He wrote from Bethlehem that despite frequent warnings before the Iraq war, the government had adopted no strategy to protect Christian minorities in the region. Dr Williams called for readers of his article to "pray for the little town of Bethlehem". He told the Today programme that despite a "traditional co-existence" in Bethlehem there were now "signs there of anti-Christian feeling by local Muslims". His comments echoed similar remarks in the Times where he said the migration of Christian populations from countries where they had formerly existed amicably with the Muslim majority "fuels the myth in East and West - that Islam can't live with other faiths". Dr Williams wrote that the Christians were not being persecuted by Muslim governments. Meanwhile, Cardinal Murphy-O'Connor said they were both in Bethlehem as an "act of solidarity". "We are here to express our desire for peace in this land of conflict," he said. "Our presence here is not just symbolic." Both archbishops said they wanted to highlight how Israel's security measures were strangling the town. They travelled with Bishop Nathan Hovhannisian, of the Armenian Church of Great Britain, and the Rev David Coffey, of the Free Churches on the four-day visit to the Holy Land.